Congrats to comment #57- Katie Karr! .....because I have pink eye and cannot go to work! Therefore, I can post a few giveaways for you! Yay, Happy Saturday (for you, not me!) I recently started reading the book "Slow Death by Rubber Duck" by Rick Smith and Bruce Lourie. In this book it talks about the chemicals that are present in every household. They lurk in everything from your shampoo to your rubber duck. (I will write more about this book later). One thing I want to share is the fact that there are not very many companies out there that say no phthalates, no BpA and no chemicals in our products. Episencial is one of those rare few! That, to me, is impressive. Episencial was founded by Kim Walls, M.S., a second-generation skin care expert from the Epicuren family, who couldn’t find skin care products for her babies that met her standards for quality and care for the environment – so, she created her own with the help of several moms and dads. 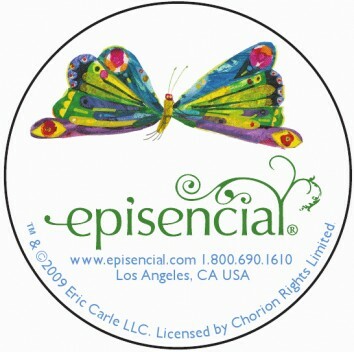 Episencial now proudly offers two distinct all natural skin care lines: Epicuren Baby featuring exclusive imagery from renowned artist Anne Geddes and the new Episencial skin care system with artwork from The World of Eric Carle. Sales of Episencial products benefit the company’s philanthropic partner Healthy Child, Healthy World and its mission to protect children from harmful chemicals. I have tried a gazillion "all natural and organic" children's bath products and Episencial is on to something. They use real fruit juices to scent their products so the fragrance is very minimal. I use their Better Body Butter myself and I don't like to share. Even though it is made with Jojoba Oil, Avocado Oil and Olive Oil, it is very light and it absorbs REALLY quickly! This totally cleared up my dry, cracked hands. Amazing stuff! I also really love their Playful Foaming Wash. The scent is a mild orange but the cleaning action is awesome. A little truly goes a long way and it tackles everything from spaghetti-caked faces to syrupy fingers with ease. This is a new favorite. I can't really say enough about a company that not only makes a difference in this world by creating products using Solar Power but also the products themselves are as green as green can be! A+ not only in my world but also in the Healthy Child, Healthy World's world too! Their products are designed to support the skin’s role in the body’s immune system to promote health and wellness as well as beauty. Who doesn't love that mantra? I know Dr. Alan Greene does. Look at what he said about our skin. Don't just trust any ole brand to get your child clean. Nourish their skin with Episencial. You will be so delighted that you did! Would you like to win 4 Episencial products? One lucky winner will be able to bathe with their Playful Foaming Wash, Sweet Dreams Bubble Bath, Better Body Butter and Protective Face Balm! How awesome is that? Its a $34 value! Just head over to Episencial and tell me something that caught your eye! Their is a lot of juicy information on their site so be creative! This contest will end on June 12th at NOON EST. Good Luck! It is open to US and Canadian entrants! found this via my google reader! I love that their packaging uses recycled and sustainable materials! I visited the Episencial website. I like that the Episencial product containers feature the art of Eric Carle’s The Very Hungry Caterpillar and that the products are baby safe for even the most sensitive skin. I would love to try the Episencial Soothing Cream for eczema, itches & bothered skin. I originally found your blog site via Twitter links from others who follow you. I would love to try their Sunny Sunscreen SPF 35. I also love that they have grants for Preschools to make them more green. fan of episenical on Facebook. Wow! I love that they offer a section on their website on craft ideas using their product boxes. Very cool! I like the Soothing Cream. I fould your site thru google search for a specific giveaway. I am entereing Karma Organic giveaway. I love they they use Anne Geddes photos on their packages. I saw that they are sold at Whole Foods in Chandler, AZ! I entered your Green Toys giveaway. My son has eczema. I would love to try the Soothing Cream. Left a comment on their wall. Entered the Green Toys Tug Boat giveaway. Entered the Goodbye Detergent Eco-friendly Dish Scrubbers giveaway. Entered the 2 Duo Press Board Books giveaway. Entered the Hey Dude Men's Organic Eye Cream giveaway. I learned that all Episencial products are at least 50% organic. Also even if i don't win i will probally buy something from this website anyway because my youngest(2months)daughter's skin is very sensitive and she breaks out in little rashes all the time. :( thanks alot for the info! I "liked" Episencial Skin Care and wrote on there wall that i found them through your blog! I really liked that they have a nonprofit partners section. I learned about a few new groups, including Infant Massage, USA! I think I originally found your site via Prizey. I entered the Karma giveaway. I entered the Seventh Generation Mother Nature Giveaway. I entered the Ergo giveaway. I'm a fan of yours on FB (Laureen M-H). their sunny sunscreen caught my eye! I like that they use artwork from Anne Geddes and Eric Carle. I would like to try the Episencial Soothing Cream for my son. I think it's really neat that they have so many nonprofit partners like Healthy Child Healthy World and Infant Massage USA. I love the Episencial Sunblock Kit for summer! The Bubble Bath looks great. I love that Episencial uses botanical, sustainably farmed, and certified organic ingredients.